Flashing ASUS Zenfone 5 Bootloop via Recovery Mode - About bootloop, we don't need to discuss about zenfone 5 bootloop or howzenfone 5 getting bootloop because based our experience it has same causes. When you want to flashing asus zenfone 5 we can guess you've the problems such as can't go to the menu, stuck on logo, always restart etc. Yes, those are some reasons you want to read how to flashing asus zenfone 5 t00j or the other versions. Usually you just can see ASUS logo but in this article we will guide you to fix it so you don't need to worry because this article will guide you to flashing asus zenfone 5 lollipop or the other firmwares and this also work to flashing asus zenfone 5 bootloop. Anyway,you can name this article like Zenfone 5 brick solution because we would like to fix something like that. 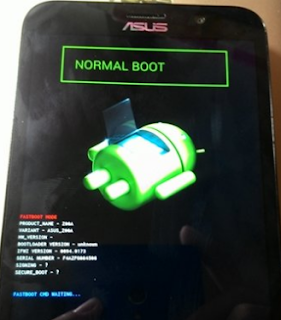 Actually there are many ways to fix bootloop problem on ASUS Zenfone 5, we can flashing asus zenfone 5 via sd card, flashing asus zenfone 5 via flash tool or flashing asus zenfone 5 via adb as we had created the article before, but in this article we are goingto try different way it is via recovery mode,let's try it together. Download Intel USB Driver we've provided the link in this post. Download ADB Fastboot tool we've provided the link in this post. Once you've download all file above, install USB Driver you've downloaded. Rename the firmware you've downloaded beofre, example: UL-ASUS_T00F-WW1.14.40.50-user, then rename it to be user to make you easier to remember it. Move and copy firmware you've downloaded to ADB Fastboot folder tool. Next, we need to turn off your phone. Just turn it off! Go to Zenfone Fastboot Mode menu by pressing power +volume up button simultaneously. In this case there will appear Android robot logo with the text there's no command. Next, press and hold on volume down button and press volume up (once) then your phone will enter to Android System Recovery. It's time to connect your phone to computer or PC. For additional information, user.zip is the firmware you've renamed before. Wait the process until it becomes 100% and make sure it is totally successfully (don't try to unplug USB). If the process is complete, it will automatically installing itself. Once installation is complete, your phone will enter to Android system recovery mode. Reboot now and your phone has been normal. Belum ada tanggapan untuk "Flashing ASUS Zenfone 5 Bootloop via Recovery Mode"